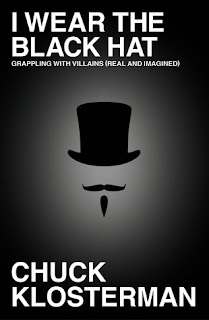 In I Wear the Black Hat, Klosterman questions the modern understanding of villainy. What was so Machiavellian about Machiavelli? Why don’t we see Bernhard Goetz the same way we see Batman? Who is more worthy of our vitriol—Bill Clinton or Don Henley? What was O. J. Simpson’s second-worst decision? And why is Klosterman still haunted by some kid he knew for one week in 1985? Masterfully blending cultural analysis with self-interrogation and imaginative hypotheticals, I Wear the Black Hat delivers perceptive observations on the complexity of the antihero (seemingly the only kind of hero America still creates). I Wear the Black Hat is a rare example of serious criticism that’s instantly accessible and really, really funny. Klosterman continues to be the only writer doing whatever it is he’s doing. I was so impressed with Klosterman's essays. For some reason I had it in my mind that Klosterman would lean so far to the left that I'd be alienated from his opinions. Instead, I found myself totally caught up in his analysis of villainous pop culture icons. Despite the fact that he is an atheist and I'm a fairly conservative Christian, we share a lot of common ground in regards to our views on villainy, which surprised me. I really appreciated that he could come from such a different place than I do, and yet express himself in a way that I could relate to and understand, even when I disagreed. Again, I really appreciated how relatable Klosterman's essays were, even on topics that I wasn't well-versed in. I feel like I learned more about the Clinton-Lewinsky scandal from his essay about Clinton than I have from any other source. The same with OJ Simpson. I think these essays will appeal to older readers who remember these events clearly and to younger readers who have no memory of them. Klosterman narrates the audiobook himself, which, in my opinion, is always ideal, especially in this genre. When you're listening to an essay, especially one written in a very conversational tone, hearing the author's voice inflection can really affect the meaning of what you're reading. You catch the author's intended sarcasm or irony in a way that ensures you get his intended meaning, not just an interpretation of a random voice actor. Read it. In the week or so that I had it playing, I found multiple real life applications for Klosterman's ideas. One that stood out in particular was a fairly intense online discussion among the Nesties about the controversial Rolling Stone cover featuring the Boston bomber. Klosterman had some very interesting ideas about true villainy versus perceived villainy and why we lionize some and villainize others. I highly recommend it on audio particularly.